In January 2009, multidisciplinary work was carried out at Chivacabe, in the western Highlands of Guatemala, to investigate the possible association of Pleistocene megafauna with early Paleoindian artifacts, including a fluted point that was previously recovered from the surface. 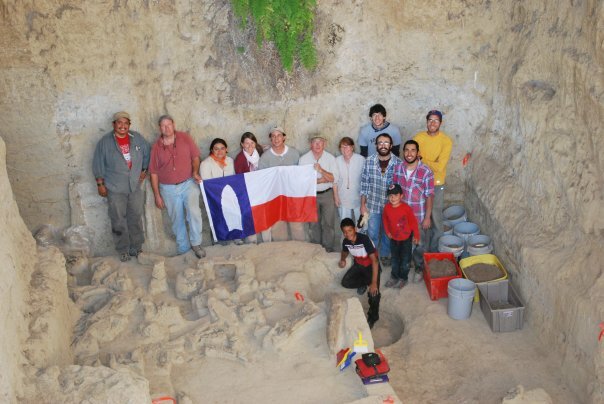 Chivacabe is one of a handful of sites in the Highlands of Mesoamerica that has yielded evidence of early Paleoindians, and this project marks the beginning of research looking at initial occupations of this region. Chivacabe is situated on an alluvial terrace in a small side valley that drains in to the Rio Selegua. Three depositional units, each containing a series of buried soils, lenses of sand and clay, and colluvial gravels from the metamorphic valley walls, were identified at the site. The Pleistocene-aged bone bed lies 4-5 m below the surface. The crew at Chivacabe in the excavation with GSAR flag. Analysis of fossil remains showed them to be in generally poor condition, and revealed no evidence of human modification or alteration. The remains are part of an on-site display and museum about Guatemala's natural and cultural heritage and receive as many as 500 visitors per month. All bones were described, recorded, and conserved in place. Identified taxa include Equus, Curieronius, Glyptotherium, and Odocoileus. Undocumented prior work recovered assorted artifacts characteristic of early Paleoindian assemblages reported elsewhere in the region. The lack of secure context, however, makes it uncertain that all of this material is contemporary with the fluted point. Nevertheless, together with the point, the assemblage provides an excellent comparison for future collections that might be recovered from secure contexts. Even though excavations in four units recovered no artifacts and the precise location of the Chivacabe archaeological site remains unknown, our geoarchaeological work, supplemented with radiocarbon dates, provides an indication of where archaeologists might look in the future for early Paleoindian sites in the western Highlands. Soils are clearly present in the region that are of appropriate age to contain early Paleoindian deposits. The 2009 field work for Proyecto Arqueologico y Paleontologico Chivacabe was performed by co-Directors Dr. Jon C. Lohse and Lorena Paiz; paleontologists Dr. Jim Mead, Sandra Swift, and Arturo Baez; geomorphologists Dr. Charles Frederick and David Yelacic; and archaeologists Judith Valle, Luis Mendoza, Miguel Medina, Molly Morgan, Julian Sitters, and Cliff Brown. The project was supported by the National Geographic Society, the Gault School for Archeological Research, Eastern Tennessee State University, and the Center for Archaeological Studies, Texas State Univerisity-San Marcos. Permission to investigate the site was granted by the Instituto Nacional de Antropologia e Historia and Don Octavio Villatoro and family.